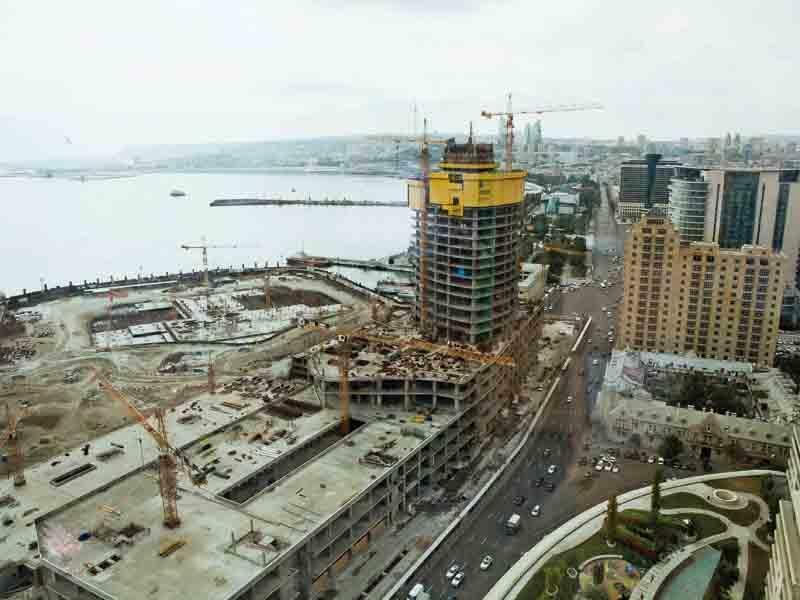 Crescent Moon in Baku: Doka to form new Harbour Skyline. The Crescent project in Baku is a construction project marked by many superlatives. Upon completion, it will be a distinctive feature in the mega-city's skyline around the harbour. This new landmark is scheduled to be erected using Doka's automatic climbing formwork that meets tough requirements in terms of efficiency and safety. 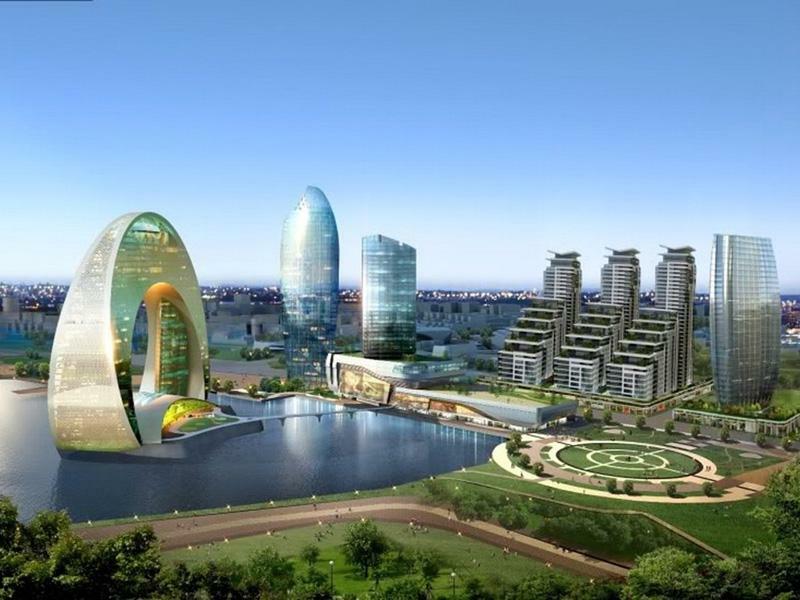 Virtually no other city in Central Asia has undergone the dynamic development seen in Baku in recent years: Located on the shores of the Caspian Sea, the city is the pulsing capital as well as the economic and cultural centre of Azerbaijan. The futuristic "Flame Towers" are not the only highrises having created excitement around the world. They too are testimony to the high level of confidence in Doka's know-how. This formwork expertise originating in Austria is also in demand near the harbour of Baku. With an area of 450,000 m² assigned to residential, office and shop space, "Crescent City” and "Crescent Place" will represent a new focal point in the skyline of Baku. The Crescent project, named after the hotel building in the shape of a crescent moon erected on a man-made island, is currently in the award phase, while the two Crescent complexes on the mainland are taking shape already. At 203 metres high and accommodating 43 floors, the distinctive "Crescent City" office tower in the shape of a torch will overlook the entire area. "Crescent Place", an 8-storey shopping centre with a 170-m residential tower accommodating 168 apartments on 32 floors, is under construction right next to it. Gilan Holding is the builder of the complex project, with the building design provided by Heerim Architects & Planners from South Korea. The building contractor is Ilk Insaat MMC, a Doka customer for many years who had already banked on Austrian formwork expertise when building the adjacent Port Baku Residence. High wind speeds experienced on many days in Baku represent great challenges during construction of the sophisticated Crescent project. Use of cranes is severely limited during periods of high winds. Add to that the complex engineering tasks involved in Crescent Place as well as Crescent City coupled with the tight construction schedule. The demand was for an efficient solution that would allow for any disruptive external factors beyond consideration to be disregarded to the extent possible. For this purpose, Doka Engineers proposed an automatically controlled formwork system. 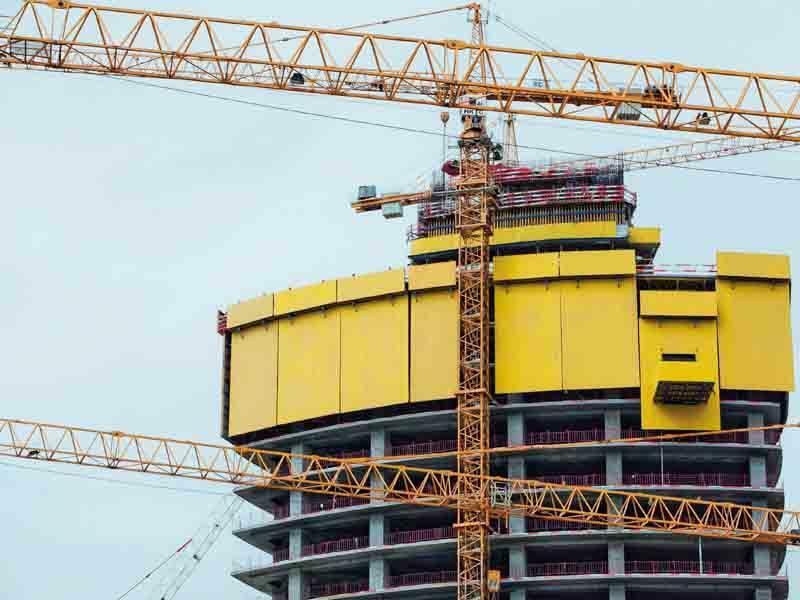 The Doka automatic climbing formwork SKE50 and SKE100 are the reliable and high-performing systems in both highrise building lots, as they ensure unrestricted construction progress during any wind and weather condition. "The schedule is extremely tight. Thanks to our formwork solution, our customer saves time and can manage one floor per week on average", Doka Project Manager Thomas Staffenberger explains. These automatic climbing systems also meet the strict safety requirements. They include protection screen Xclimb 60 serving as an enclosure and protecting workers from weather and falls. The increased sense of safety on the part of the construction crew improves personal performance and as a result total productivity. It not only reduces costly crane use but also saves on manpower and therefore calculable fixed costs. The large-area formwork Top 50 is used to erect the massive core walls. Top 50 is a pre-assembled large-area formwork allowing for adjustments as necessitated by the architectural requirements in relation to form, size and form-tie pattern. For construction of the floors, the load-bearing tower d2 is used as well at Crescent Place. The table lifting system TLS attached to the automatic climbing formwork also allows for rapid and crane-independent repositioning of the floor formwork. Furthermore, the TLS optimises site logistics and increases efficiency. Here, the construction crew is also continuously kept safe by the protection barriers enclosing the entire circumference of the construction site. Mert Ersoy, Project Manager at Ilk Insaat MMC is pleased by the well-coordinated cooperation: "Doka's formwork solution is a perfect match for our requirements: high-speed construction progress, economic processes and for expenditures for personnel. And in spite of all this, or perhaps precisely as a result, ongoing safety of our crew is always the utmost priority." Thanks to their early involvement, Doka Engineers were able to provide valuable information starting with the planning stage and put together a package for the different pouring sections that was optimal overall. Doka Formwork Instructors trained the construction crew on-site and explained safe handling of the formwork systems. During the initial pouring intervals, the Formwork Instructor took on the role of supervisor and was available for questions at all times. Any challenges that arose were mastered professionally and without any red tape. 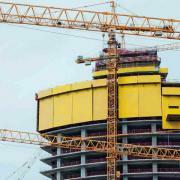 Doka Specialists have been on-site in Baku since March 2013; completion of the forming jobs is scheduled for May 2015. 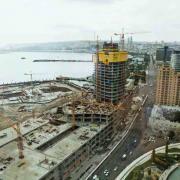 Thank you for your interest - Crescent Moon in Baku: Doka to form new Harbour Skyline.. 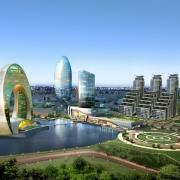 Thank you very much for your interest - Crescent Moon in Baku: Doka to form new Harbour Skyline..